all mine! : SCALE14x - and 8 million users for ownCloud! SCALE14x - and 8 million users for ownCloud! After covering openSUSE and KDE booths at SCALE in my previous blog, let's talk ownCloud. Note that, despite the awesomeness of this blog post, our biggest news right now is probably the announcement that ownCloud has an estimated 8 million users! 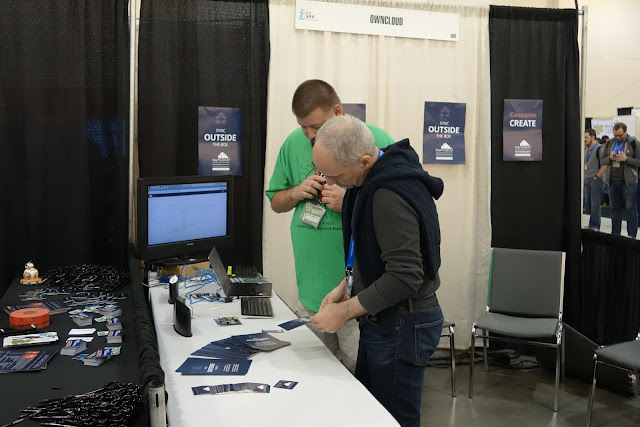 So SCALE14x had an ownCloud booth staffed by the Dynamic Duo Matt McGraw and yours truly. We had the usual flyers, posters and stickers but Matt had also brought a big monitor and Mountain Dew. In case you don't know the drink, it is important to know that it is by far not as natural as the name suggests. The plan with the drinks was to hand them out to people who would mention Chris' hair (the Linux Action Show host) - Matt had told people to come by our booth and ask about it to get a drink. Sadly, nobody did show, either due to fear of Mountain Dew (my bet) or there were few or no Linux Action Show viewers at SCALE14x... The idea is brilliant, though, and I think we should try again next year. Perhaps with a drink that isn't fluorescent green, or make sure Chris mentions it in the Linux Action Show itself? The monitor had another purpose: demo ownCloud, of course. That turned out real cool: upon arrival at my hotel, I had received a package with the latest prototypes of our Pi Drive kits send by Western Digital! The casings have a cool ownCloud logo on them and there was a custom, 3d-printed cover to close the thing off on the top, looking real slick with ownCloud logo cut-out. Anyhow, we assembled one Pi kit, put ownCloud on it (duh) and ran it from the screen so we could demo ownCloud. The other kit we kept in half-assembled state for people to check out. 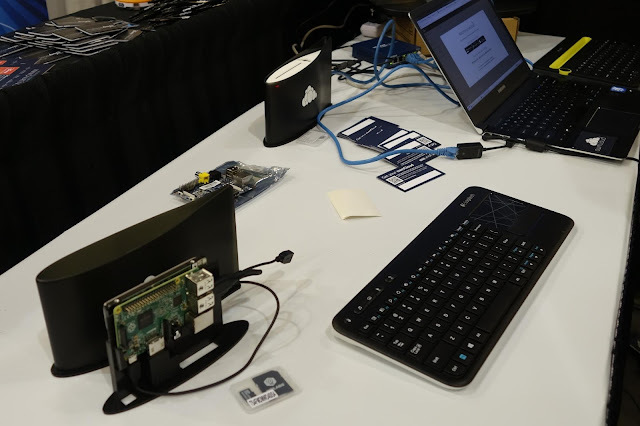 We had a *lot* of people who were interested, we certainly sold many of the existing Pi Drive kits (you can already get them, without ownCloud though, from the WD store) while many others will wait for us to release the PiDrive with ownCloud. Maybe I'm very optimistic here but the excitement was so great I have the feeling we'll sell those 500 in no time. On a related note, the Western Digital team working on the Pi Drive/ownCloud project came by the booth for a chat, too. It was great to meet them and shake hands in real life! talked to Ubuntu people about the Pi project, they love it and want to work with us on that and other things. Cory Doctorow came to our booth to tell us how much he loves what we do. I asked if I could quote him but forgot to ask him for a picture. A photography-loving couple came by our booth and they were super duper excited to hear about ownCloud. For them, a better way of sharing pictures, esp large amounts (dropbox ain't so good with the tens of gigabytes) was really interesting. The girl claimed that if you could see emoticons IRL she'd have hearts flying out of her head. Yeah, disturbingly geeky, but fun! somebody noted that it'd be good to have had 'a marketing person' at our booth, as no 'marketing person' would've forgotten to ask Corey for a picture. I thought about new job opportunities. Talked to Intel people about Minnowboard - intel Pi like board. Might be interesting for our Pi Drive project - at least it has USB 3, Sata, room for a MSATA card (!) and loads of ram. Of course, there is price but - let's see. Talked to the community manager from Digital Ocean, we'll do some promo together. He also asked if we could give feedback on their ownCloud setup/one- click-install image. I've asked for a free login to check it out, I'll then ask around soon if anybody is interested in checking out what they have and giving them tips on improving it. I'll also ask how many users they approximately have, would be interesting to know! Corey came by the booth again, as he wanted to tell us about XO-ware and their tech to get through firewalls. I first made him hold our poster and took a pic for on twitter. Talked to CEO of XO-ware. They found a way through the firewall of routers which involves an external server but no proxy-ing. They plan on open-sourcing their stuff next month, we should look into it for ownCloud Proxy and the Pi-Drive project. Oh, and it is interesting tech in general, of course! Check it out. Talked to many, many more interesting, nice, sweet, peculiar people from all over but there's one last special thing I must share: I did not hear A SINGLE COMPLAINT. None. Nada. Zilch. Sure, people were happy to hear we're working on stuff like the upgrade process, but none of them complained. Maybe it was the sunny weather but I just think you're all doing a GREAT job, because that is what people told me!!! I gave two talks, one about ownCloud scalability and Raspberry Pi. That is a weird combination indeed, it was inspired by Joas' cool BananaPi Cluster project. I couldn't use that, though, as it is a bit stuck and I myself didn't have time to experiment much either. Thus, instead, I talked about scalability, different Pi devices and the Western Digital project (again, lots of people excited about that). Find it here. The second talk was a longer version of the lightning talk I did at the ownCloud Contributor Conference. Clearly, that was compressed too much, this one worked out far better and people said they liked it a lot. Well, hey, if I insult you and yet you come ask for more, either I do something right or you do something wrong, correct? The talk starts at about the 8th minute, enjoy. I did also talk to some press people, spend sleepless nights due to jetlag and found decent Blueberry Pancakes. I miss good bread whenever I visit the US (and UK) but pancakes, oh boy, THAT they do right like nobody... Hmmmm. Of course I had fun dancing the security theater at the airports I went through, with some special fun at Gatwick. Going through a very comprehensive security check right after stepping off your plane from Los Angelos seems... beyond useless. And all those comprehensive checks didn't notice there's a typo in my name on the tickets. Ahum. I'd probably be stuck half the way if they really read my email AND had the resources to actually do something with it - but we all know that they rather throw more hay on the stack than spend time finding the needle so I felt quite safe emailing a report including this note to the ownCloud mailing list from London Gatwick! Well, that's it, if you read through all of it to this point I tip my hat to you for your commendable stamina enduring my writing. 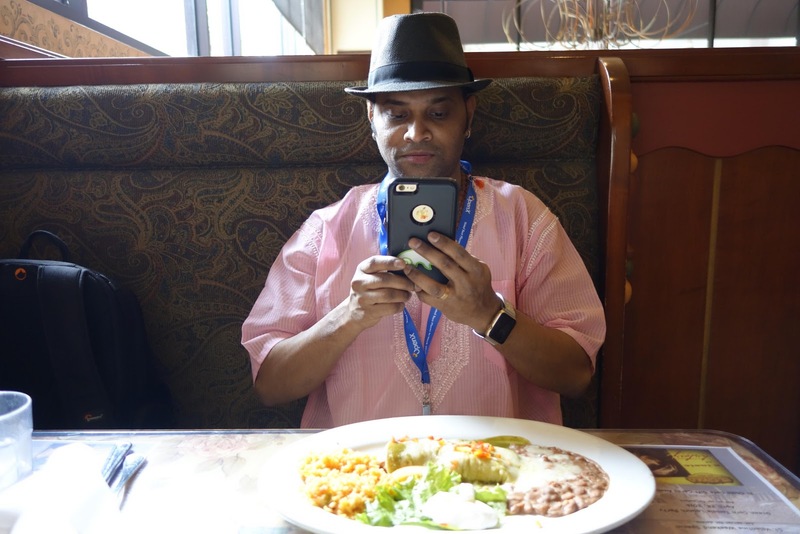 If you want that hat tip on camera, look me up on FOSDEM and we'll take a pic with me tipping my hat to you. ownCloud, openSUSE and KDE in Brazil? How to Upgrade ownCloud: Don't Skip Releases! I'll be at SCALE and FOSDEM, how about you?